Belgian waffles are usually thicker and have larger and deeper square indentations than regular waffles. These waffles are sometimes also made using yeast instead of baking powder for leavening. Eating a number of Belgian waffles can cause you to go over your daily calorie budget if you aren't careful, especially if you top them with lots of butter, syrup and whipped cream. A restaurant serving of Belgian waffles topped with whipped cream and syrup can have as many as 530 calories. A single large Belgian waffle made using a baking-powder batter and regular all-purpose flour has about 304 calories before you even add any toppings. 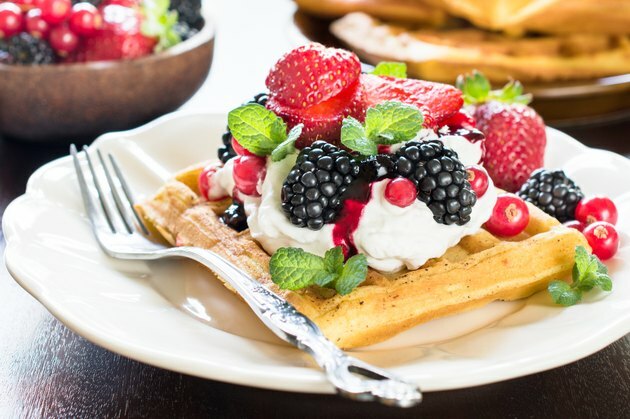 Top a large waffle made with a yeast-based batter containing unsweetened soy milk and a powdered egg replacement instead of milk and eggs with 1/2 cup of berries, and you'll be consuming about 336 calories. If you're willing to consume a few more calories, you can make a healthy but indulgent whole-grain version of Belgian waffles topped with Greek yogurt, sliced almonds, strawberries and maple syrup for 364 calories. How Many Calories Are in Big, White-Bread Rolls?